Do you really care if I post two sandwich recipes in one week? Probably not. So what does it matter? I don’t know! I’m not worried about how you’ll feel about this BBQ Tempeh Sandwich recipe, though. It just happens to be one of my favorite easy meals and I’m pretty sure you will love it too. 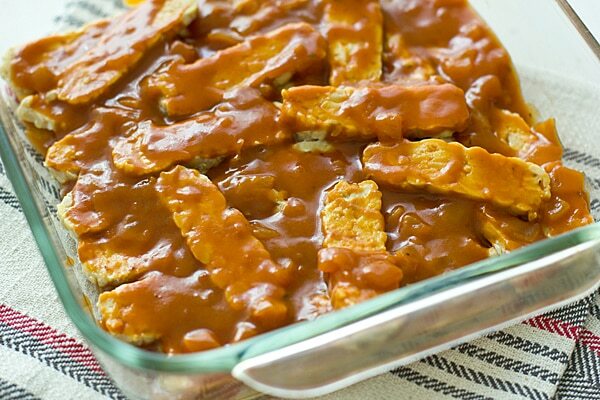 Slice up some tempeh, marinate it in barbecue sauce, heat it up in a skillet. Done! You can serve it just like that or make it into sandwiches with a quick slaw. It’s kind of the same idea behind my Baked Barbecue Tofu, except with tempeh and no baking. If you haven’t cooked with it before, I have a post all about how to use tempeh–it’s much easier to work with than you probably think and when you slice it thin, as you do for this recipe, it soaks up the sauce you add to it. Don’t be scared to use tempeh! It’s a delicious vegetarian protein source when you know how to use it. Seriously easy (and seriously delicious!) 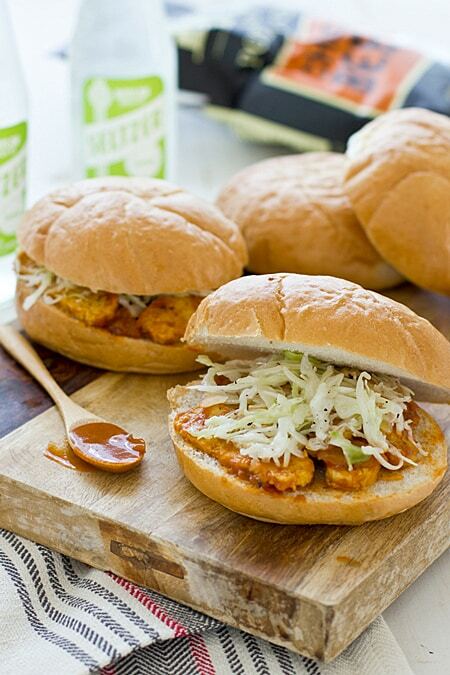 vegetarian BBQ sandwiches made with tempeh. Spread 1/4 cup of barbecue sauce on the bottom of a small baking dish. Add tempeh and top with remaining barbecue sauce. Gently toss to coat. Let marinate for an hour, stirring after 30 minutes. Meanwhile, whisk together olive oil, vinegar, sugar, salt and pepper in a small bowl. Stir in cabbage and set aside. Spray a medium skillet with oil or cooking spray and heat over medium heat. Add tempeh and sauce; cook until heated, about 5 minutes. Serve on rolls with slaw and additional barbecue sauce (if desired). Thumbs up from me and my raw-veggie-hating spouse. I made two little changes: 1) Tossed some baby carrots in the food processor with the cabbage 2) I ground a generous amount of blackpepper into some mayo and let that sit for a day before we had the sandwiches. It added a nice heat. 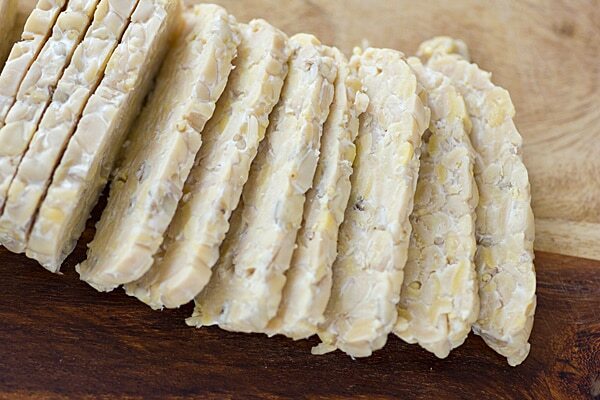 Do you feel that it’s necessary to steam the tempeh before cooking? I’ve read in several vegan cookbooks that it kills bacteria and also lets the tempeh absorb marinade better. I think it’s a matter of personal preference. When I’m crumbling tempeh for a recipe, I never steam it. If I’m using chunks or slabs, sometimes I’ll steam it if I have the time, other times I don’t. After drooling over this recipe and telling myself again and again that I needed to try it, I FINALLY made it the other night for dinner and it was a hit! We’ve been vegetarian for a few years but this was my first attempt cooking tempeh – my husband has requested that we add these sandwiches to our ‘regular’ rotation of meals! I used the slaw mix but he swapped it out for some cheddar cheese instead and said the combo was amazing. Oh that sounds yummy! I’m sure he would LOVE that, he’s a big fan of quadrilles! If you cut up the tempeh, boil it for 10 minutes, and then marinate it, it’ll soak up all that marinade much more! It’ll also make it much thicker and ‘meat’ier! Sometimes I’ll steam tempeh before I use it, but I’ve never heard of boiling it before! It doesn’t fall apart in the water? It doesn’t fall apart at all while boiling, it works out great! At least the kind I always get that seems to be at all the grocery stores. Do you know what brand of BBQ sauce you used?